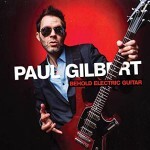 Share the post "Album review: PAUL GILBERT – Behold Electric Guitar"
‘Behold The Electric Guitar’ is a delightful, passionate, adventurous and imaginative album. It’s full of technical mastery that is counterbalanced by a sense of humour as evidenced by the song titles. It’s a restless album shot through with Paul Gilbert’s incisive attack, biting tone and sharp riffs on a fractured musical journey full of intricate pulses, tension builds and magical resolutions. Above all, it has an essential crossover appeal to discerning rock fans, guitar freaks and 70’s fusion fans alike, with its deep grooves, melodic phrasing, soaring solos and intense, but judicious shredding. Gilbert’s playing is an object lesson in taste. He builds his solos like a painter applies the most delicate of brushstrokes, only bringing pressure to bear when the song or solo requires it. In short, he is one of the few contemporary guitarists who still serves the song. Every note is significant, every melodic phrase illuminates another aspect of the song and each tonal inflection brings new possibilities. His unbridled imagination and fluency of his playing makes you forget that this is an instrumental guitar album. All the salient aspect of the album feature on the opening cut ‘Havin’ It’. And we do indeed have it, on some breathless interplay between Gilbert and keyboard player Asher Fulero, over a magisterial rhythm section in which New Orleans bassist Roland Guerin adds punch, funk and feel. Gilbert goes on to solo in a conversational manner that leaps out the speakers like a guitar preacher. ‘Behold The Electric Guitar’ is a conceptual title, in as much as Gilbert sets himself the task of making something meaningful of his extant abilities. He’s always looks forward to new possibilities with solos that have a freshness and spirit so often lacking in contemporary shredders, but then again he has so much more to his armoury than simply speed and a relentless barrage of notes. His magnificent band serves him well. And when it all locks together as on the swaggering groove of the slide inflected ‘A Snake Just Bit My Toe’, they push him to the limit. Such is the intensity of the band’s intuitive interplay that when they slip into the following bluesy shuffle of ‘Blues For Rabbit’, it has a far greater impact than it might otherwise have had, simply because it acts as a cathartic release for what has gone before. ‘Behold Electric Guitar’ also feels like a coherent musical journey, even though it is essentially a double album. There are plenty of imaginative musical pit stops, full of different tones, tempos and styles in a musical landscape that sounds as if the musicians won’t settle for anything less than special. The album ebbs and flows as all good journeys do. Listen for example, to the relaxed melodic feel of ‘Every Snare Drum’, which makes maximum use of space and dynamics, or the evocative ‘Let That Battery Die’, which is a melodic highlight of a busy album. The piano, percussion and stuttering slide guitar intro creates a showcase for Gilbert’s warm expressive tone, over some potent drums and a gnawing melody, as he unleashes a flowing cascade of notes with more twist and turns than a mountain stream. Then there’s his slide playing which acts as a counterweight to his outer worldly clean attack. He achieves an almost lap steel tone on ‘I Own A Building’, which again is cleverly offset by sudden propulsive phrases, which serve to emphasize the strong melody. It’s also a track that makes use of ‘slide magnet’ modification to his guitar, allowing him to slip from emotive sounding slide to a cleaner tone. There’s also plenty of variety here, though he never strays too far from the kind of Beck influenced 70’s fusion. ‘Everywhere That Mary Went’, for example, features a repeated staccato proggy opening full of sudden tempo changes and guitar squalls, before it hits a mighty groove and an unexpected organ solo punctuated by more jagged guitar bursts. ‘Love Is The Saddest Thing’ is a double time rocker with a Purple meets jazz-rock feel, that balances the fluid with the frenetic. The ironically titled ‘Sir, You Need To Calm Down’ features a swaggering intro to an up tempo guitar/keyboard riff driven piece on which Gilbert shreds all around the core melody and adds a little funk for good measure. He consistently brings his own stamp to his imaginative guitar playing, particularly so on both ‘I Love My Lawnmower’ –with its playful poppy feel– and the afore mentioned ‘Let That Battery Die’. He also gets funky on ‘A Herd of Turtles’, complete with an Anglo poetic drop-in that cleverly acts as buttress to the frenetic playing either side of the narrative. There’s a final shimmery wah wah slide intro to ‘Things Can Walk To You’ which initially suggests Hendrix, but is closer to Santo & Johnny. This entry was posted in ALBUM REVIEWS, ALBUM REVIEWS (Mobile), All Posts and tagged album, Asher Fulero, Behold Electric Guitar, blues, fusion, guitar, instrumental, jazz, Jeff Beck, Jimi Hendrix, Paul Gilbert, prog rock, review, rock, Roland Guerin, Santo & Johnny. Bookmark the permalink.